Utility Industry Credit Union Partners with Groundwater & Environmental Services, Inc. and Distributed Systems Services, Inc. Groundwater and Environmental Services, Inc., a technical services company with locations across the country, and Pennsylvania-based IT company Distributed Systems Services, Inc., are the newest partners of Utilities Employees Credit Union, a financial worker benefits provider serving American utility and energy companies. Nearly 700 GES employees and more than 100 DSS staff will now have free access to UECU’s financial services, which are designed to help utility and related-industry workers and their families improve their financial situations. Our mission is to improve the financial well-being of employees and improve productivity for the employer. It’s a win-win. Utilities Employees Credit Union (UECU) has partnered with Groundwater and Environmental Services, Inc. (GES), a nationwide provider of environmental consulting, engineering, and technical field services. GES, which is headquartered in New Jersey, will now offer UECU’s financial benefits to 700 employees in its field offices in more than 21 states. UECU offers utility, energy, and related-industry companies a free voluntary benefit they can extend to employees and their family members, to promote financial wellness, reduce company health care costs, and enhance worker productivity. Like many companies in the utility and energy services sector, GES has expanded and dispersed its business locations across the nation to keep pace with industrial needs, making its partnership with virtual credit union UECU, a logical strategy to serve its employees’ financial needs. GES employs a team of scientists, technicians, engineers, and administrative professionals who serve clients in the oil and gas, government, petroleum marketing, and industrial utility sectors, including several of the 600 other sponsor companies in UECU’s field of membership. UECU’s field of membership also now includes the employees of Distributed Systems Services, Inc. (DSS), an information technology provider, which serves a variety of industries with solutions including network services, device management, data hosting, and social software. The company manages IT complexity issues, mitigates IT risks, and optimizes the IT investments of its 400 clients in the Mid-Atlantic region. DSS will offer UECU membership as a free employee benefit to its more than 100 staff members who are spread among multiple Pennsylvania locations. UECU provides free nationwide access to financial products and services, credit counseling, and financial education to utility workers and energy workers. The credit union offers additional employee promotions, benefits support, and financial education services to companies that offer membership as an employee benefit. Some companies offer UECU membership as a stand-alone benefit, while others incorporate it as part of a company financial wellness program or employee assistance program. 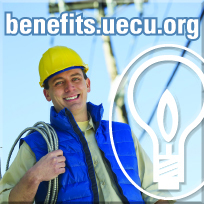 To obtain information on providing free employee financial benefits through Utilities Employees Credit Union, companies in the utility, energy, or related industries can visit benefits.uecu.org or call 800-288-6423, extension 6034. Utilities Employees Credit Union is a nationwide, virtual credit union providing financial services to utility and energy workers and their families since 1934. Its membership includes the employees of 600 companies and members of Energy People Connect, an association for individuals currently employed or pursuing employment in the energy industry. UECU is among the less than one percent of U.S. credit unions to consistently receive the A+ “Excellent” Weiss Rating for financial soundness and one of the few financial institutions to reward its members with a year-end bonus dividend, which last year totaled $1.2 million.